And kudos to you for putting it into a blog post so well. I've already passed this on to several people this morning. Your posts give me hope. Maybe the world has a shot at not going up in flames quite so soon. "I'm a peacemonger. You have a problem with that?" It's sad that approximately the same amount of Americans who died on 9/11 have now died in a war with a country that had nothing to do with 9/11. Although this article does have some good points in it. When I read it; I can't help but think that a freshmen in highschool wrote it. This article just doesn't help much with the argument against the war. If this comment doesn't connect with you, that is because I've written it in the exact same format that you've written your post. All feeling and very little facts. As a member of the military having served in Iraq I feel let down by the citizens whom I took an oath to defend them from enemies both foreign and domestic. In a sense from this article, you are telling me that I am incapable of doing my job. This pains me to hear. If you your selves could have seen the changes we have made in the Iraqi peoples lives you would smile. Knowing that you made a difference for the good in someone’s life however big or small that may be is a tremendous thing. However, the media fails all to often to report these actions and incidents thus painting a much drearier picture. I can only assume a story of my fellow service men and women’s deaths make a better headline. I am disheartened America. I agree with Karl. Your post is all feeling and little fact. Evidence: The decision to invade Iraq was not Bush's decision alone. If you believe the war to be lost, that is your opinion. The facts are that 29 Democrat senators voted for this war and 81 Democrat representitives, and the entire resolution was carried by a much wider majority than even the 1991 Gulf War, when Iraq invaded Kuwait (you may be too young). So much for journalism in this country. Anonymous guys and members in military. We never had any doubts of the patriotism and bravery of our troops. You have done a good job. But why should we be in the middle of a civil war. Bush Says, " Politicians should not be telling the Generals what to do in a war"
May I ask," who sent the troops there in the first place with wrong evidences? were they not the politicians.?. What is Bush then.? not a politician. May be a Moron (Superlative of a moron). Its his war. He doesnt want to clean the mess he brought us into. He wants to pass time until his term is over. Then some one else who comes will have to clean it up. Then he will say, " See? I never let go in my presidency, these new guys accepted defeat and brought back the troops". Its not our war anymore, but Bush just cant bring the troops home and be called a loser, liar. I really like bush for his Adamant position. What’s really unfortunate is that Ostroy can’t seem to see the connection between not supporting the war and not supporting the troops. Let’s see…. • Our troops are dying because they don’t have the equipment/support that they need. • They don’t have the equipment they need because Congress won’t allocate the funds for it. • Congress won’t allocate the funds for it because most Congresspersons are against the war. • Most Congresspersons are against the war because most people that voted in 2006 were against the war. • Most people that voted in 2006 were against the war because our troops are dying. It’s like Vietnam all over again. I remember my father—a liberal to the core—telling me that the main reason we lost in Vietnam is because our troops were too hobbled to do their job. “It was like, Okay, here’s this line that you’re not allowed to cross,” he told me. “The enemy can cross that line, but you can’t. And so the Viet Cong would march across the line, kill a bunch of Americans, and then run back to the other side of the line where we couldn’t touch them.” It would be many years later before I ever realized something, and brought it up with my dad: was the military really making these decisions? Was there some general somewhere that decided that our troops couldn’t cross that arbitrary line? Of course not. It was Congress, making their incredibly intelligent laws, that got in the way of victory. Just like in Iraq. He was stunned. He started to respond, wound up muttering something incoherent, and promptly changed the subject. I love my dad to the ends of the earth, but his silence belied the truth: his beliefs of three decades were shaken to the core by nothing more than cold, hard logic. Here’s the biggest irony of all: the Vietnam conflict was started under the watch of… wait for it… a Democratic president, and a Democratic Congress! The nation wound up electing a Republican named Richard Nixon—twice!—because the people believed that a Republican president could get us out of Vietnam (which, ultimately, is what happened, although not under Nixon’s admittedly abbreviated watch). In fact, save Jimmy Carter, every Democratic president in the 20th century sent troops into war against someone or other, so it’s certainly not like the Republicans have a corner on that market. I guess what I’m saying is that the issue of “failing” wars has nothing to do with political party; it has to do with public perception. For almost two centuries, Americans were focused on the public good, and whenever our nation entered a war—often reluctantly—it was with the backing of the people, and we trounced the adversary. The second the public started placing the lives of a comparatively few individuals above “life, liberty, and the pursuit of happiness,” we started losing, and we haven’t won since. Finally, just to be perfectly clear, I am firmly anti-war. War is a horrific thing, costing the lives of thousands—even millions—of our brothers and sisters around the world. If we could all just get off our high horses and get along, war would be completely abolished, and the question of whether or not such-and-such war is justified would become suddenly moot. Wouldn’t that be wonderful? The problem is that there’s plenty of us out there—people like Adolf Hitler, Saddam Hussein, and yes, even Harry Reid—that value popularity and/or power over the freedom of others. Until we can, as a race, overcome that unfortunate human tendency, wars will continue to occur, and there’s nothing the Democrats and the liberals can do to stop it. Believe it or not, there are people on this blog that actually believe the military has accomplished A LOT over in Iraq. Of course, we are hated and attacked on this website by all the idiot-liberals that out number the people like me on this blog. Anyone who says that we've accomplished nothing in Iraq does not support the troops - no matter how much they claim that they do. Whenever I defend the troops in Iraq, I'm usually told to go join them, and called a nazi. The libs here are idiots who think our military is the biggest evil in the world. Obviously, Ostroy has fallen for the lies that the left continues to repeat and repeat. Lie #1: The war is lost in Iraq. Have we ever lost a battle in Iraq? Has our military been destroyed? If anything, democrats are losing the will to fight which could be considered a victory for the enemy. Mis-management of the war is another issue. Our troops are being forced to fight with their hands tied behind their backs. We need to take the gloves off and hit hard. Lie #2: There were no WMD's in Iraq. Many WMD's have been found in Iraq, and the world knows that Saddam used such weapons on his own people. Saddam walked around with a pointed finger in his coat pocket, and we called his bluff. Better that than letting him bully the world around. Lie #3: According to the post, "There was no connection to bin Laden and Al Qaeda." THAT IS INSANE!!!! I can't believe they posted this on ABC. Perhaps Ostroy meant Hussein and Al Qaeda. It has been widely reported that OSAMA BIN LADEN and Saddam Hussein had an operational relationship from the early 1990s to 2003 that involved training in explosives and weapons of mass destruction, logistical support for terrorist attacks, al Qaeda training camps and safe haven in Iraq, and Iraqi financial support for al Qaeda--perhaps even for Mohamed Atta. Lie #4: True, sustainable Democracy (in Iraq) is but a fantasy. It's already happening to some degree. Give peace a chance. Keep repeating the lies, and more and more ignorant people will come to believe them. Who cares what William F. Buckley says? What does he know? Harry Reid is a traitor who has committed treason in my opinion by contributing to the enemy's propaganda and lowering the moral of the troops and the American people with his comments. He should immediately resign his position. The democrats cannot be taken seriously with that moron as their leader. The only way we lose this fight is if we abandon it. It's also easily forgotten that Germany had 7 years of post-war 'insurgency' following WWII. 3:14 brings up excellent points. The left doesn't care about truth, they want the United States to lose in Iraq so they can say "I told you so" politically. The ONLY thing Ostroy and his gaggle of liberal sheep care about is the mission statement "Our mission is to help Democrats regain the White House and Congress". They don't care about America, they ONLY want the democrats in power. 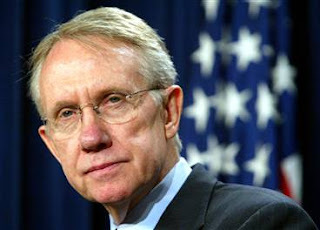 you are being disingenous by not quoting Reid's first statement, "The war in Iraq is lost". you and others are trying to soft soap this by only reportiing on his subsequent characterizations of his first quote which brought about the firestorm. What does WMD have to do with whether or not we should stay in Iraq? Also, no links between Saddam's regime and terrorists? How about asking the HUNDREDS of members of Saddam's regime who have no said otherwise through their membership in al Qaeda leadership positions (regimeofterror.com)? It's a nice talking point. It's just not true. There are many success stories about the improving Iraq situation of which the American people never get to hear about through our current media and journalists. I have many friends in Iraq who email me regularly with good news and pictures to go with it, yet that doesn't sell here in the U.S. as news or promote a journalist quick enough simply because it's not the evil-spirited, downhill all the way, interest-piquing crap that Americans have shoved in their face everyday. This war should not be presented to Americans as a hollywood tabloid, and I, for one of many, am sick of all the negativity. You should talk with the soldiers there who are making a difference and you should research harder than usual (because it's not that hard to find) for the positive success stories and present that side of the situation. Even if you don't, I'm tired of the traitorous people who are putting my country's safety in jeopardy over their political righteousness, and I'm telling you and all of the others who plan to do the same thing you're doing that I'm one American who has had enough! United we stand, Divided we fall. So, let me see if I understand the Repubs' argument against Sen. Reid's comments: if you criticize the leadership of the war and you want to bring the troops home to keep them from fighting in the middle of a civil war, according to the Repubs, you're being unpatiotic and unsupportive. The only way to support the troops is not to criticize the President's plan to continue to send more and more troops to Iraq, but to support it in silence so those same troops will most be certainly be killed in the midst of the civil war. Can anyone explain to me how THIS ill-conceived, misbegotten, God-forsaken plan supports the troops? Put signs up on freeways. Impeach bush for blowing the job.